As you may know, the Pennsylvania Historical and Museum Commission’s Bureau for Historic Preservation acts as the Pennsylvania State Historic Preservation Office (PASHPO). As such, PHMC receives an annual appropriation from the National Park Service to help administer both state and federal historic preservation programs throughout the Commonwealth. Part of PHMC’s agreement with the Park Service requires that PHMC develops and implements a statewide historic preservation plan. In effect since 2006, Pennsylvania’s current plan expires in 2011, and PHMC has begun the process of preparing the 2012-2017 preservation plan. The purpose of the statewide plan is to establish a vision, goals and implementation strategies for historic and cultural resource preservation for all of Pennsylvania. As you are all very well aware, cultural resource preservation and development is key to the long-term success of the PA WILDS vision. As one of the PASHPO’s key partners, PHMC invites you both to participate in the planning process and also to help PHMC ensure that the development and implementation of the new plan includes broad public participation. PHMC requests that people complete the Pennsylvania Community Preservation Values survey. The Survey will help PHMC assess what the citizens of Pennsylvania value in their community in order to determine preservation priorities within the state. The survey closes October 30th. Access the survey at: Please Complete PHMC’s Community Historic Preservation Values Survey. Thank you in advance for taking the time to participate in PHMC’s survey and to help PHMC get the word out about their planning process. The success of Pennsylvania’s statewide historic preservation plan depends largely upon public participation, and PHMC greatly appreciates your feedback! The future of the Civic Arena, the iconic silver-domed structure that has graced Pittsburgh’s skyline for nearly half a century, could be decided Thursday. City-Allegheny County Sports & Exhibition Authority members are scheduled to vote that day on whether to demolish the 49-year-old landmark to clear the way for an office, residential and commercial redevelopment proposed by the Penguins. The decision to schedule the vote came after SEA consultants Oxford Development Co. and Chester Engineers concluded in a final report after an eight-month historic review process that demolishing the arena with its distinctive retractable dome was the “recommended” option for redevelopment. The vote was scheduled the same day Reuse the Igloo, the group seeking to save the arena, came forward with its plan to transform the building into a venue for bowling, annual Christmas and Halloween-related events, bicycle polo, book festivals and weddings and other celebrations. Todd Poole, president of Philadelphia-based 4ward Planning LLC, the Reuse the Igloo consultant, estimated the various events could generate as much as $2 million a year, enough to cover annual operating costs of $1.9 million. Rob Pfaffmann, the Downtown architect who heads Reuse the Igloo, said that if SEA members vote to demolish the arena, his group would file for a court injunction to block it. Mr. Pfaffmann said he is “extremely concerned” that tearing down the arena could amount to anticipatory demolition under the National Historic Preservation Act and jeopardize future federal funding related to the development. “The battle is far from over from the point of view of Reuse the Igloo,” he said. SEA board chairman Wayne Fontana wouldn’t say which way he planned to vote, and SEA executive director Mary Conturo refused to speculate about the outcome. “All I can tell you is that it’s on the agenda,” she said. The SEA has moved the start of its meeting up by one hour to 9:30 a.m. to allow for public comment in advance of the vote, Ms. Conturo said. The Penguins, which want to redevelop the land with offices, housing and commercial uses, welcomed the vote. “We think it’s clear that the best thing for the future of the city and the region is to tear down the old arena, clear the land for development and re-connect the Hill District to Downtown,” spokesman Tom McMillan said. Board members will take up the matter even as Reuse the Igloo unveiled details of a reuse plan Tuesday that include the development of a 24-lane bowling alley in the bowels of the arena. It also called for conversion of some of the arena’s suites and luxury boxes into rental space for meetings and parties, weddings and other celebrations. Reuse the Igloo is pushing its plan as an alternative to the Penguins’ proposal to demolish the arena and redevelop 28 acres of land. Like the Penguins, the group also has plans for housing and office space on part of the site. But Mr. Poole said one of the advantages of the group’s plan is that it works even if no development takes place around the arena. “Even if it didn’t happen for 10 years, you still have civic space that can be programmed and stand on its own,” he said. Reuse the Igloo estimates conversion costs at $14 million. It believes the transformation to civic space would take three years. Never overlook the potential of a small lot. 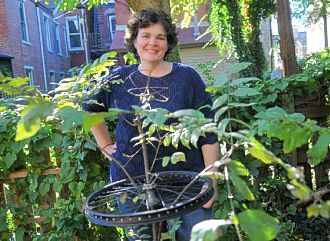 Pittsburgh artist Rose Clancy’s 22-by 90-foot space in the North Side’s Mexican War Streets neighborhood is much more than a garden. It’s also an art installation, autobiography, environmental statement, archaeological dig and strategy for building community. GardenLab@516 began humbly but, as gardens do, it grew. Ms. Clancy had purchased a dozen past-their-prime white baking potatoes that were beginning to sprout in a supermarket to conduct growth experiments on. When they outlasted the original project, she decided they deserved to continue. “I admired the potatoes’ will to survive and go to the smallest bit of light and to grow,” Ms. Clancy said. The property at 516 Sampsonia was filled with debris tossed over the fence through the years, but that didn’t deter Ms. Clancy. In April, she began cleaning it up and carried several bags of garbage out. The rest she turned into planters and sculpture. The site is quirky and personal, with its own brand of surface beauty underlain with metaphor. It has also become an active part of the neighborhood. Ms. Clancy’s late father, Thomas, was a true blue Irishman from County Galway, who “grew potatoes as a crop for his family. [As a child] I ate a ton of potatoes,” Ms. Clancy said. So the garden is in part a tribute to him. Her late mother, Ruth, who Ms. Clancy said was an excellent gardener, is also present in the form of a plaster bust she sculpted in high school but never finished. “She never said what she had to do to finish it,” so Ms. Clancy is doing so by “aging it.” With fall rains, dark liquid leached from black walnuts found in the lot began to transform the white face, staining it. 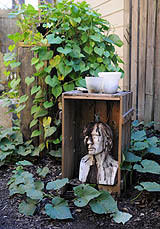 Adjacent neighbors and passers-by stop to talk, and some shared in an unexpectedly large bean harvest that matured on the vines she’d planted, along with morning glories. “I didn’t grow with the intention of raising a crop, but I got a crop,” she said. “The same way that Mattress Factory has given me, I’ve given her,” Ms. Clancy said. Elsewhere, rows of pottery shards, bottle glass, dishes, a cream separator from an old glass milk jug and other objects reflect the lot’s history. Some of the found artifacts — Christmas tree ornaments, a radiator key, Minnie Mouse head — are mounted in “The Collection Box,” which visitors crank to view. “There’s no trash coming in anymore,” Ms. Clancy said. She’s preparing the garden for winter, dismantling the potato planters and moving some of the sculpture indoors. She plans next to string “Connectivity Wires” high across the lot in the direction of neighborhood people the garden has connected with. These will be embellished with beveled glass and mirrors intended to create “a light show in here throughout the winter” as they move in the wind and in and out of sunlight. Ms. Williams will be connected by lines painted across Sampsonia. “She’s so important,” Ms. Clancy said. With gaping holes from its broken windows, the fenced-in brick building at Rebecca and Kelly avenues in Wilkinsburg is an eyesore, one that’s too big to ignore. People moved out of the three-story fixer-upper a long time ago, before Vanessa McCarthy-Johnson or anyone else can seem to remember. Pigeons and blackbirds live there now. A public-private partnership on Tuesday detailed plans to invest $10 million in house-restoration projects in Wilkinsburg. A total of $8.8 million will pay for renovating two early 20th century apartment houses — the Crescent Building at Rebecca and Kelly, and the Wilson Building on Jeanette Street. Borough officials and investment groups say restoring housing would be key to turning around the neighborhood, which has been blighted by crime and struggling for a defined economic blueprint since the demise of the steel industry in the 1970s and ’80s. About 19,000 people live in Wilkinsburg, where unemployment is about 9 percent. Nail salons, barber shops and mom-and-pop businesses line most of its main thoroughfare, Penn Avenue, offering little variety or chance for jobs. “This is a huge investment that we hope will eventually attract more new families to move here,” Mayor John Thompson said. The two buildings will house 27 one-, two- and three-bedroom apartments. Each apartment building will have a community room, laundry area and computer lab. Hosanna House, a community center and social services agency in Wilkinsburg, will provide support services to tenants. The project, which includes acquiring and demolishing three neighboring structures, is being paid for with loans and grants from Allegheny County, Historic Tax Credit Equity, Federal Home Loan Bank of Pittsburgh and federal stimulus money that Pittsburgh History & Landmarks Foundation is administering. Work on the apartment buildings is expected to wrap up next year. A second project — paid for by Allegheny County and the Scaife Foundations — will restore three vacant homes at Jeanette and Holland Avenue for $1 million. Once they are renovated, they will be sold to buyers. Last year, TriState Capital Bank pledged $1.8 million over six years to help Wilkinsburg continue its housing renovation and development projects. Pittsburgh History & Landmarks Foundation yesterday opened its housing resource center, located in a former Packard dealership in Wilkinsburg. It will provide workshops and programs dealing with home improvements. A neighborhood open house is scheduled for 11 a.m. Saturday, with a workshop on restoring vacant lots as gardens and green spaces. A public-private partnership today detailed plans for $10 million in house-restoration projects in Wilkinsburg. A total of $8.6 million will be used to renovate two early 20th century apartment houses — the Crescent Building at Rebecca and Kelly avenues and the Wilson Building on Jeanette Street. “This is a huge investment that we hope will eventually attract more new families to move here,” Mayor David Thompson said. He spoke at a news conference to spotlight the new projects and mark the grand opening of the Pittsburgh History and Landmarks Foundation’s housing resource center in Wilkinsburg. The two buildings will house 27 one-, two- and three-bedroom apartments. Each building will have a community room, laundry area and computer lab. Hosanna House, a community center and social services agency in Wilkinsburg, will provide support services to tenants. Work on the buildings is expected to wrap up next year. The second project aims to restore three vacant homes at Jeanette and Holland Avenue for $1 million. When they are renovated, they will be sold to buyers who earn 120 percent or less than the area’s median income. Money for restoration of the three homes is being funded by Allegheny County and the Scaife Foundations. A public-private partnership today unveiled plans to do housing restoration projects in Wilkinsburg worth almost $10 million. “This investment will expand our ability to attract people back to Wilkinsburg,” Mayor John Thompson said after the announcement. He was one of 10 speakers from government agencies and businesses that have undertaken re-use projects in the struggling borough of 19,000. The session was held at the new Landmarks Housing Resource Center in Wilkinsburg. The larger effort announced today is an $8.6 million complete renovation of two early 20th century apartment houses. They are the Crescent Building, at Rebecca and Kelly avenues, and the Wilson Building, about a block away on Jeanette Street. When work is completed next year, the two buildings will have 27 one-, two- and three-bedroom apartments. Each will have a community room, laundry area and computer lab. Hosanna House, a community center and social services agency in Wilkinsburg, will provide support services to tenants, who must meet income guidelines. The second project, budgeted at slightly more than $1 million, will restore three abandoned but architecturally significant homes on Jeanette Street and Holland Avenue. When renovation work is complete, those homes will be for sale to buyers who have income no greater than 120 percent of the area’s median income. The apartment project also involves acquisition and demolition of three neighboring structures. It is being funded by loans and grants from Allegheny County’s Department of Economic Development; funds raised by the sale of Historic Tax Credits; private dollars from the Federal Home Loan Bank of Pittsburgh; and federal tax credits administered through the Pennsylvania Housing Finance Agency. The center will have a community open house for people in the neighborhood at 11 a.m. Saturday. That event will be followed at 12:45 p..m. by an inaugural workshop on the topic of restoring vacant lots as gardens and green spaces. The cost for the workshop is $7. Those interested should call 412-471-5808, extn. 527, or e-mail marylu@phlf.org to register. Conflicts are the bread-and-butter of journalism, of course — so much so that readers and reporters alike can find it all occasionally wearying. So when a big, juicy conflict comes to a sorta-kinda happy resolution, it’s a relief to share the news. Turns out it’s also instructive to take a closer look at the process and ask ourselves, “How the heck did that happen?” The people who threw themselves into protecting Allegheny Commons Park aren’t completely sure, but most of them — most — feel considerably less worried than they were this time last October. “It was at Pumpkin Fest last year that we built the edifice,” recalled Bernie Beck, former president of the East Allegheny Community Council. The “edifice” was a plywood mock-up of a cooling station Duquesne Light intended to build in the northeast corner of Allegheny Commons Park, and it was almost as attractive as the utility’s proposed 9-foot-tall, 28-foot-long metal structure promised to be. Which is to say, not very. Allegheny Commons is the city’s oldest park, established by state legislation in 1867. A $2.3 million overhaul of the Northeast Common is slated to begin this fall, as part of the $16 million “Allegheny Commons Restoration Initiative.” So when Duquesne Light announced in May 2009 its unilateral decision to put a cooling station in that northeast section, citizens responded with indignation, public meetings and that attention-grabbing life-size mock-up. Almost as quickly as it appeared, the plywood eyesore came down, but it had done its job. A year later, Duquesne Light crews appear to be well under way on an alternative site. They’ve been busy at their 1970s-era underground facility in the Northeast Common, but at street level they’re headed east, digging a trench to 728 Cedar Ave., a residential property that Duquesne Light recently acquired. Neighbors say a garage there will be razed to make way for a new cooling station. It seems that utilities, like God, move in mysterious ways, because none of the community participants I interviewed could say exactly how this new plan came to be. Alida Baker, the Commons Initiative project manager, credits the combination of vigilant community groups, restoration steering committee input, city Councilwoman Darlene Harris and the weight of historic state legislation with changing Duquesne Light’s direction. “They didn’t really discuss what they would do — it just became apparent,” Ms. Baker said. He last heard from the utility in March and was “still waiting for them to get back to us” when construction began. While it’s somewhat unpalatable, it’s not uncommon for a large entity to buy property as quietly as possible, thus keeping the price down. Well, almost everybody. Charles Angemeer joined the community’s opposition to potential despoiling of the Commons as soon as he moved into the neighborhood in July 2009. The issue died down a bit, and his work picked up, so he was thunderstruck to learn recently that his front door is only 30-some feet from the utility’s new building site. The community council also hopes to acquire the adjacent empty house, to continue its Cedar Avenue sprucing-up. So like I promised up front, a kinda-sorta happy ending where almost everyone gets some of what they wanted. That’s life — you heard it here first.